They may be called bar carts, but their functions can go way beyond holding libations. If you feel your space is missing a little something but are not entirely sure what, consider one of these versatile pieces under $100. The multitasking furniture has many uses beyond simply beverage storage - try one in the bedroom to hold all your "getting ready" essentials, your living room to hold magazines and flowers, or next to the couch as a multi-level side table. 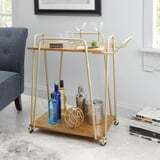 No matter if you want a place to show off your favorite cocktail ingredients or not, these cheap carts are a cute storage solution.